Gates and plaque inscription. Famine Graveyard. Sligo, Ireland. They were evicted from their ancestral lands, farms, and cottages. They starved although shiploads of grain were harvested in Ireland and sent to England. They ate grass when they were not allowed to fish or hunt. Theirs was a grim passage from rotting fields to odious workhouses to ignominious burial in famine graveyards. Unnumbered thousands. We remember their pain and anguish. We also remember the strong threads of faith, family, and fealty that were woven in their journey. They lost so much. But they never lost their allegiance to community, their love of the land, and the deep roots of their culture. This is their legacy and our heritage. 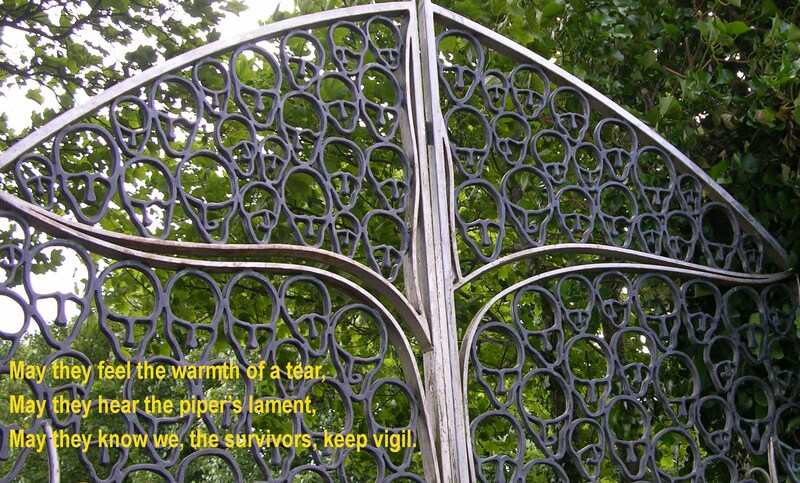 We hear the strains of the piper’s lament and we remember them. In those strains we hear and remember the truth, power, and potential of who we are.